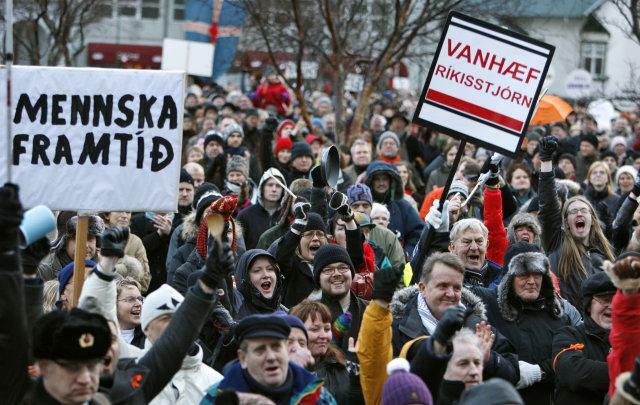 ◆Why Doesn’t the Media Report on the Triumph of Democracy in Iceland? What Are They Afraid Of? The Economic Crash in Iceland led the “Pots and Pans revolution” leading to some radical changes. Humanist Party members Julius Valdimarsson and Methusalem Thorisson have carried out an appraisal in terms of the sensibility of the people in general and on the political Scene wondering if such process can promote Human Rights based Real Democracy. Pressenza Rekyavik, 9/2/11 As humanists with a common aim of a Universal Human Nation the authors of the report believe that what has happened and is happening in Iceland is nothing special to Iceland, only a reflection of the same development suffered all over the world, even though it might appear in a different way and with different expression according to differences in cultures and in location in the global kingdom of capitalism and financial tyranny. Icelandhas been subjected to the same neoliberal policies in the last three decades as most other western countries, bringing money and power into the hands of financial institutions and their faithful political guardians who have adjusted their lawmaking to meet their masters´ demands. 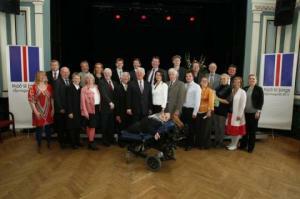 In 2002 the major state banks were privatized and sold/given at a low price to the good friends of the major political parties, at that time Sjálfstæðisflokkurinn, theIndependenceparty and Framsóknarflokkurinn, The Progressive Party. In 6 years the new owners had increased the value of the banks to twelve times the size of the Icelandic State Budget. In October 2008 this bubble burst with the consequence that all the major banks inIcelandwent bankrupt, the only three that had survived the crash of Lehman Brothers inNew York. The Government decided to guarantee all deposits in the banks without limit, a positive measure for old and ordinary people’s savings but the law also guaranteed the deposits of the rich and very rich, many of whom were responsible for the crash. Soon the IMF was asked to come to the rescue. People started to gather in front of the Parliament building, banging pots and pans, shouting and making noise demanding that the Government should step down, the Director of the Central Bank (David Oddson, who had been prime minister for more than twenty years and had resigned in 2005 to take on this office) should be fired and those who suffered the consequences of the bank crash should not be made to bear the losses, rather the bankers and financial speculators responsible for it to happen should. They also demanded a new Constitution replacing the existing one written by the once ruling Danish king. On January 23rd Geir Haarde and his entire Government resigned. On April 25th general elections took place leading to the formation of a coalition Government with the Social Democratic Alliance, the Independent Party and the Left Green Movement. The Director of the Central Bank was fired. The New government continued to accept the IMF guidance which did nothing for the badly hit population.BritainandHollanddemanded that theIcelandicStatewould guarantee deposits in outlets of Landsbankinn (one of the major banks) in their countries. It had promised sky high interests paid on the deposits before the crash. The Icelandic Public was expected to pay millions of Icelandic kronas for those empty promises of this private bank when it became bankrupt. 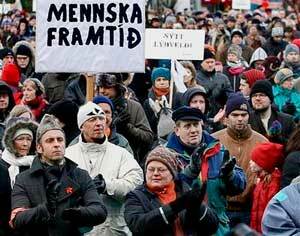 The people ofIcelandprotested and demanded that President Olafur Ragnar Grimsson refuse to accept this claim. In a referendum 93% said no to accepting the claims. The government tried to make a new contract with the British and the Dutch but people protested again, and a new referendum again confirmed people refused to pay for the blunders of the banks. Although members of the general public were invited to contribute to writing a new Constitution, which has been handed to the Government, all demands of putting it for referendum or giving the people power to accept it or reject it have so far been rejected. The Pots and Pans revolution consisted of massive protests in the first month after the bank crash where thousands of people took part, mainly in front of the Parliament. It was nonviolent all throughout but when some people started to throw stones at the police others from amongst the protesters made a human wall to protect the police. An association was formed to fight for the interests of hard hit families with a membership of over 5.000 people still although the Government has more or less rejected their claims. Meetings took place in the biggest Cinema and other places where Ministers and high officials from the Government, from the Trade Unions and other influential bodies were invited to sit in a panel and answer questions from the public. They were broadcast in the National TV and had strong impact on the public. Groups were formed assisting people that were about to lose their homes, others gathered around the homes of the bankers and businessmen demanding that they pay for the damage they caused. Some groups started to look for alternative economic models and financial system. An organization was formed to promote Real Democracy which put forward proposals of many radical democratic changes to the Committee which was writing the New Constitution, but few of those changes were included. An organization was formed called “Siðbót” or “Morality” actively supporting issues of human rights and the claims of the people. In the summer of 2009 an organization named “Alþingi götunnar” or the “Parliament of the Street” was formed. This informal organization consisted of the most active grass root organizations and political groups of the revolution, amongst them, the Humanist Party. This organization had a meeting in front of the Parliament every Saturday from autumn 2009 until spring 2010 with demands of compensation to families and individuals who suffered from the Crash and to reject the claims of the British and the Dutch to pay for the banks blunders. The people’s revolution formed a Citizens Movement that put forward candidates in the elections in April 2009. The agenda was to uphold the demands of the revolution. Although four were elected they failed to carry out their stated commitments. So this is the sad story of the political child of the Pots and Pans revolution. One obvious reason for this was that the Citizens Movement was formed more or less around specific issues or demands (safeguarding the interests of those who suffered most from the Crash) and did not have any actual political program. The slogan “Mennska framtíð,” “A Human Future,” became very prominent in the Pots and Pans revolution and it was very noticeably favoured by the media being the only one that had a positive reference and the only one pointing towards the future. All others were more or less denouncing the Government or demanding specific measures. The Humanist party had its main speaker in the first meeting of the Parliament of the Street emphasizing the importance of people starting to meet and communicate about a different society everywhere, in the schools and neighbourhoods and workplaces and about how the revolution should come from the people and be for the people. Creative posters, originally fromSpain, denouncing the financial institutions with humour inspired many young people. People showed remarkable solidarity with great common spirit, managed to dismiss the Government and the chief director of the Central Bank, stood up to the Financial institutions and refused to pay the debts of corrupt banks. A Political party was founded on the basis of the main demands of the people for compensation for their losses because of the Economic Crash. On the other hand the “Pots and Pans Revolution” did not promote radical demands for a new society nor a new economic system. The new government consists of the traditional parties, has no intention to change the banking system and is following IMF guidelines obediently to restore the old system and make sure that the tax payers should carry the burden. There is amongst the activists some loss of spirit and the feeling that things will slide into the same old pattern. Nevertheless a few groups continue to work on constructive themes such as a new financial system and preparing the foundation for a democratic bank. The Humanist Party has monthly open meetings on Humanism and Democracy in Politics, discussing “Is Interest an Economic Cancer?”, “Is Speculation Economic Terrorism?” and “Let´s take the Power from the Banks”. The question regarding the sensibility of the people and whether the bank crash and the “revolution” has changed the way people feel or think is a difficult one. On the surface nothing much seems to have happened and the 4 traditional major parties seem to have similar support as they had before the Crash. The political program is just the same as before and the Government celebrates at this exact moment that the IMF has finished its task and all their proposals of cutting costs of welfare, education and health has been met, having “restored the financial system”. On the other hand in the Opinion Polls 90% of the people have no faith whatsoever in the politicians and what can be sensed is a common discontent in spite of an incredible reluctance of people to let go of the old setting and open up to new alternatives. However people have experienced their strength, the general trust towards the system has greatly diminished and many people have realized in a deeper manner the need for real change and Real Democracy.